Welcome to the SOLi School! Seed of Life Institute (SOLi) and the SOLi School are the realization of a long-held vision of founders Ronald Holt and Lyssa Royal Holt. With more than 45 years of combined experience as seminar leaders, spiritual teachers, channels, yoga/martial arts instructors, and authors, they bring a new, fresh look at what spiritual growth really means in a valuable and practical way, and provide experiential tools to help students navigate the journey of their own awakening. 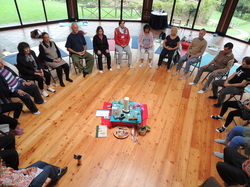 The SOLi School, through its creative school structure of three "classrooms" that explore a specific aspect of spiritual growth in each classroom, provides students with a balanced and grounded approach to personal transformation while nurturing the individual qualities and talents of each student. Our methodologies are diverse and varied and may include teachings from both ancient and modern wisdom that can be directly applied to life on Earth today. For more information, please see our Mission Statement and the SOLi School sections called School Structure and Courses. This web site provides a schedule of events, a list of faculty, feedback from past students, a library of articles, a small store, and more. Welcome!